Snow melting quick on house roof can indicate attic insulation deficiencies. 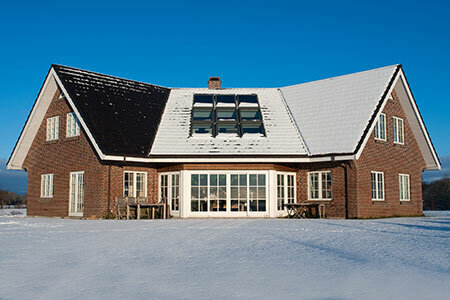 While in the midst of winter it is often too late to add insulation to home attics, snowfalls can actually help to identify potential deficiencies that can be corrected for next year. After a winter storm snow will collect on the roofs of most homes. That’s the time to keep an eye on how that snow melts. Barring any tree overhangs or other factors that can cause variations, homeowners should watch for any areas of the roof where the snow melts quickly. This can be an indicator of heat rising from the home interior to the roof due to under or inadequate insulation. If this occurs, it is a good idea to check the attic insulation Likely, if that snow is melting quicker than the temperature is warming, the attic needs an insulation upgrade. Best option is to have a professional energy auditor or insulation contractor do an audit and make recommendations. CIMA producers provide a contractor referral service to help consumers find professional insulation contractors. These installers are also knowledgeable and experienced with cellulose insulation, which is the best option for those interested in both superior insulation properties and Eco-friendly building solutions. This entry was posted in DIY & Insulation Tips, News & Information. Bookmark the permalink.